Studio A had a grid of lighting hoists – referred to as barrels – arranged in rows and columns, I think there were 96 in all. Some in the corners of the studio were short ones, but most could accommodate up to 3 luminaires, and were normally equipped with 2 double ended ones, with a soft light on one side and a key light on the other. 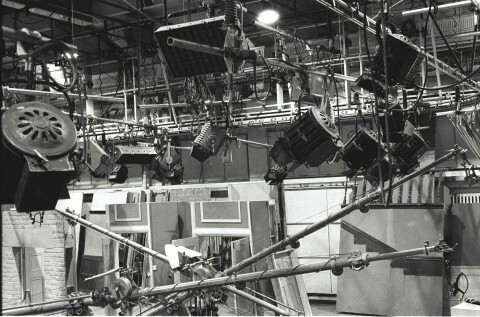 The lighting hoist could be lowered to floor level to change luminaires, or add extra ones, and it was quite common for additional spotlights, or effects lights to be added to the standard complement of 2 dual source lamps, or even for one or more of the dual source lamps to be substituted by another more suitable lamp. This was all done on the set and light day. Each barrel (apart from the short ones) had 3 lighting circuits each controlled by its own dimmer. There were a number of outlets on the studio wall also controlled by a dimmer for connecting to cyclorama lighting units or floor standing lamps. The lighting control system was called a Qfile, and was an early system using computer type memory storage based on magnetic core stores. 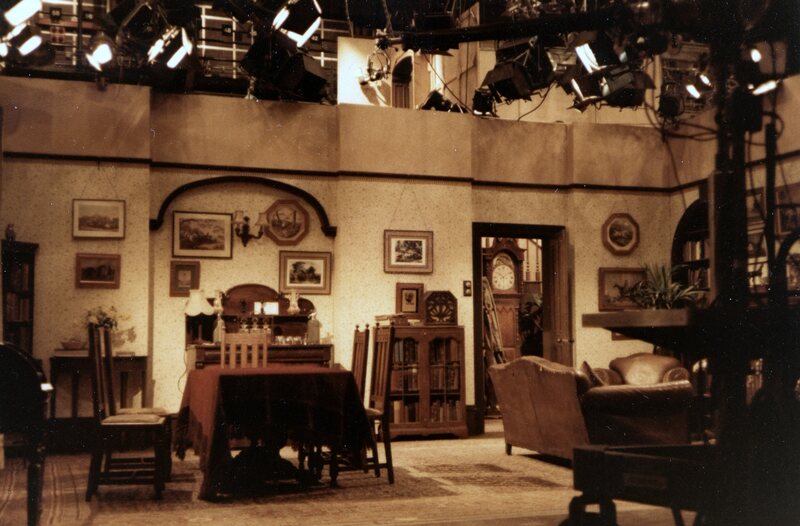 This allowed lighting scenes to be stored both in terms of which lights were on and how bright they were, and facilitated smooth and quick lighting transitions with ease. In the lighting gallery there was a mimic display, laid out in the same way as the lighting barrels, which showed which lights were on in the studio in white, and the next scene (preview lighting) in green. To test the mimic lights one memory (99) was set with all the lamp circuits on, but woe betide you if you ever cut that up to the live scene. The studio would become very bright very briefly, before the circuit breakers in the basement cut the power off. There would then follow about a 20 minute hiatus while the electricians, went through the sequence of going to the basement and of re-setting the circuit breakers. The lighting panel had a set of meters to show how much power was being drawn, and it was expected that the lights would be distributed across the 3 phase supply to keep a balanced load. The circuit breakers were designed to trip if any one phase exceeded 150kW, so in theory the total lighting load could be close to 450kW, which made for a pretty hot studio. Most of the lamps were switchable 2.5 / 5kW, but occasionally 10kW lamps would be used, so it soon added up. The Qfile operator was drawn from the engineer pool, but because of its specialised nature, was also one of a small group of people. It was recommended that operators had been on a lighting course, and seen as the first step towards becoming a TM2. Initially Dave White, Peter Wood-fisher, and Ian Dewar, with Mike Lee as a stand in. In the mid 70’s Dave left for Norwich, and Peter moved to VT, Brian Jones then became a regular but Mike had to fill in a lot more. I had a brief time operating it, but was never accepted for a lighting course, and did not really take to it, and would not have coped with some of the fast paced work that the more experienced handled. The Qfile mimic could be made to display some words in a fairly crude block text. When Playschool was hosted “Little Ted” was the favourite. One had to use your imagination a bit to see the words, but that was the kind of idle exercise that helped brighten some quite long studio days.